Katy Perry (birth name Katheryn Elizabeth Hudson) was born on October 25, 1984. She and siblings David and Angela were raised in Santa Barbara, CA in a strict Christian household by evangelical minister parents, Keith Hudson and Mary Perry. The future popstar was blocked from the secular world. She picketed Madonna concerts and the only book she was allowed to read was the Bible. When Perry made her big music debut with “I Kissed A Girl” in 2008, the lyrics raised a lot of eyebrows in the religious community. Some of her other hits include “Roar,” “Firework,” “California Gurls,” “Waking Up in Vegas,” “Wide Awake,” “The One That Got Away,” “Hot n Cold,” “Dark Horse,” “E.T.,” and “Teenage Dream.” She’s toured the world to perform for fans and promote her albums such as “Prism,” “One of the Boys,” and “Witness.” Perry headlined the Super Bowl Halftime Show in 2015 and the Victoria’s Secret Fashion Show in 2010. She’s won MTV VMAs, Billboard Music Awards, Kids’ Choice, People’s Choice, and American Music Awards. She will serve as a judge on “American Idol” when the reincarnatin of the show debuts on ABC in 2018. Perry wed actor Russell Brand in India in October 2010. A mere fourteen months later, her husband sent her a text message to notify her he planned to file for divorce on New Year’s Eve 2011. 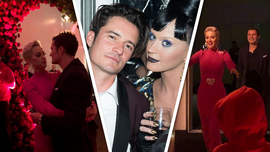 She moved on and had some very public flings with John Mayer and Orlando Bloom. New Guest Home ... For $7.5 Million!!! Birthday Love From Orlando, His Son & Miranda Kerr!!! Destroys Backpack Kid ... In Crazy Dance Battle!